Demeyere produced the first pots and pans using ControlInduc, a safety system that limits the maximum temperature to 250°C on compatible induction cookers. It avoids burning and makes sure that the pan remains warm without the risk of overheating. These products are available with non-stick coating (ControlInduc) or without coating (ProControl). Many consumers and chefs often experience problems setting the correct temperature for frying meat, fish, etc. When the food is overheated, it burns and sticks to the bottom of the pan. A product with a non-stick layer prevents the food from sticking, but at specific high temperatures, the coating will disintegrate and loose its non-stick properties. Food is always fried at a temperature between 170°C/335°F and 230°C/450°F. Above 250°C/485°F, food starts to carbonize and should not be consumed anymore. 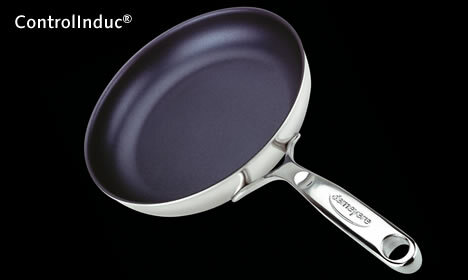 Teflon, used in all kinds of non-stick layers, starts to disintegrate at a temperature higher than 280°C/535°F. These risks are avoided by the use, exclusively on induction cookers of the ControlInduc system. Up to +/- 220°C/425°F, a ControlInduc product heats up normally like any other pan, but above that temperature the force of the inductors gradually decreases and stabilizes somewhere between 245°C/475°F and 250°C/485°F. Then, it automatically adjusts as to how much power is required to keep this temperature, or to compensate for the heat lost in the air or the food. When cold or raw food is placed in the pan, the pan will cool down. Alternatively and automatically, the power of the inductor is increased without any intervention from the user. Also even when a pot is left on the induction cooker for hours on end, it is designed not to overheat. For the ControlInduc products with a non-stick coating this means that the coating remains intact, since this design allows the temperature to remain constant at 250°C/485°F. We accredit this exceptional result to the very special properties of the magnetic material incorporated into the outer layer of the product. As you may be aware, an induction cooker needs a magnetic substance in the receptacle to create heat. Without this, the receptacle will not heat up on the inductor. The magnetic material Demeyere uses in the outer layer of the ControlInduc product is a unique super alloy that remains magnetic up to 250°C/485°F. Above this temperature, the material loses its magnetic properties and instructs the receptacle to decrease its energy levels. The ControlInduc system is now released for all induction systems for home usage that we know, including Siemens, Bosch, Gaggenau and NEFF. The system works on all brands, except that on some brands it will only work up to the maximum level below the booster function. However, the power levels from 1 to 9, or the highest below the booster level, are by far sufficient for a rapid and correct working of ControlInduc. There is also compatibility with the special professional induction systems which are used in the catering industry. For a correct usage of ControlInduc on these professional systems, please contact Demeyere by e-mail. Specify the brand name, the type, the product number and the year of production of your induction system.